While performing a penetration test, it’s quite common to encounter JBoss and Tomcat application servers. These servers are generally attractive targets for attackers because they expose a number of different functions that could lead to remote code execution. Exploitation is generally reliable, repeatable and poses virtually no risk to availability of other applications. Additionally, it can be a challenge for organizations to properly secure installations of this software. In a previous blog, we detailed a rather simplistic technique with which some systems can be exploited by simply altering the HTTP request verb. While that specific vulnerability can generally be identified by commercial vulnerability scanners, exploitation of the software can occur via avenues that may be less obvious. Although discussing the full inner workings of JBoss is beyond the scope of this article, it’s important to note that there are a number of different ways a user can interact with and deploy web applications on a JBoss server, including the JMX Console, Remote Method Invocation (RMI), JMXInvokerServlet and HttpAdapter. Metasploit contains modules to interact with a number of these methods. Each one of these methods requires specific configurations to enforce security. A single misconfiguration is generally all that’s needed for an attacker to compromise the system. As was already known, RMI ports were open. However, the JMXInvokerServlet did not require authentication. 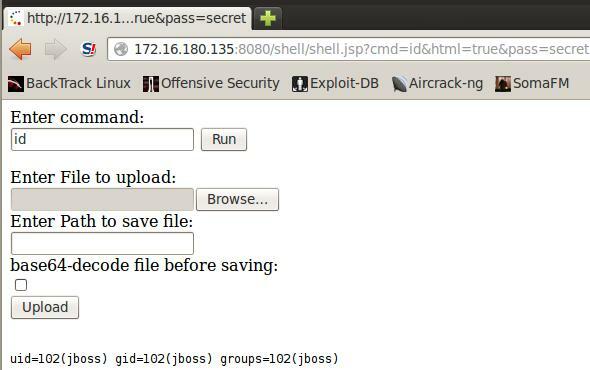 root@bt:/pentest/web/jboss/jboss-4.2.1.GA/bin# ./twiddle.sh -s 192.168.0.35 get "jboss.system:type=ServerInfo"
To exploit the system, we manually created a WAR file that contained a reverse-connect payload. Then we used twistd to quickly set up a web server that would be used to serve the malicious WAR file. The important item to note is that this was NOT detected by two of the commercial vulnerability scanners we utilized. It demonstrates not only the limitations of relying solely on automated tools, but also the importance of performing penetration tests. We’ve encountered another situation in the field which requires a bit of creative thinking to exploit. If the JBoss server is behind a firewall that restricts egress on all ports, we cannot host a WAR file with a malicious application to deploy, as the JBoss server will not be able to retrieve it. Consider a JBoss server that is behind a firewall that only allows us to hit it on port 8080 and allows no communication back to our host from the server on any port. In this situation, it is best to take advantage of the Bean Shell Deployer built into JBoss. We can leverage the BSHDeployer to execute arbitrary bean shell scripts on the target machine. In order to exploit the server, we’ll be using a bean shell script to write a WAR file to the local filesystem that we can then deploy using the MainDeployer. The guys over at RedTeam Pentesting have a great set of tools to assist us in demonstrating this technique.